Hello again! I know it has been a ridiculously long time since I have posted. I haven’t forgotten about this blog, it is just that summer caught up to me. We have been busy pretty much every weekend since May. Summer is sadly coming to a close, which means I may have more time since the kids are starting school. If we could, we would do the whole summer again. That would be fine by us (maybe not Finnegan). We could load in a few more camping trips, maybe another trip to Door County…alas, it isn’t going to happen. The summer has been busy with cooking, celebrating birthdays, going on trips, making sausage and making beer. The last two Paul has really done by himself, but I like to pretend that I help sometimes. We just haven’t captured many pictures of our meals and I didn’t take much time to sit down and write. Since the summer bounty is at its height with tomatoes coming out of our ears. 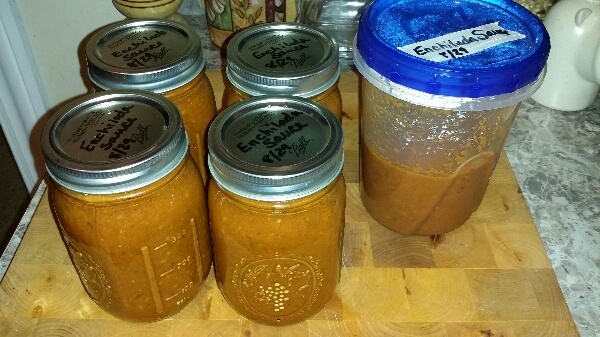 I thought I would make some enchilada sauce to freeze for later use. My brother was so kind to offer his garden up as well since he is out of town, so I had a lot of tomatoes to play with. Half tomatoes and add quartered onion on a baking sheet with sides. Drizzle with olive oil and sprinkle kosher salt over. Roast for about 45 minutes to 1 hour on 375°F. Transfer tomatoes, onions and drippings into blender and blend until smooth. Heat 3 tbsp olive oil in a dutch oven over medium high heat. Saute garlic cloves until golden, about 1 minute. Add in cumin, chili powder, oregano and cayenne and saute another minute. 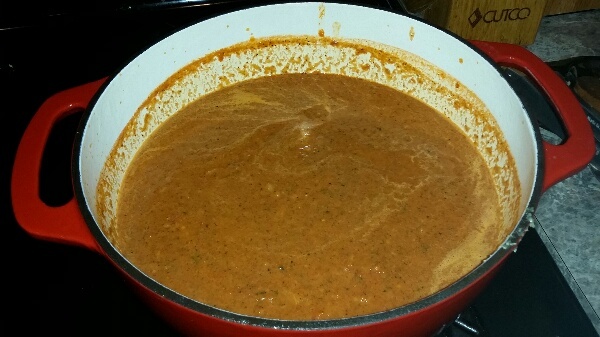 Pour in crushed tomato mixture and stir until everything is mixed well. Add in 1 tbsp brown sugar and let simmer for 30 minutes until thickened. Use immediately, refridgerate for up to one week, or do as I do and freeze until a later date. I love digging in the freezer for those lovely summer harvest to brighten up the winter months. It reminds me that we will be able to enjoy the lovely summer again.